Welcome to Adelia Homestay, Pasir Mas Kelantan. Do you love shopping? Adelia Homestay is just 20 minutes from one the Kelantan’s most vibrant shopping area, Rantau Panjang (Paradise of shopping). Strategic location: Located in the vicinity of Pasir Mas Town, close to Restaurant, easy reach of Wakaf Cek Yeh, Pengkalan Kubor and so on. 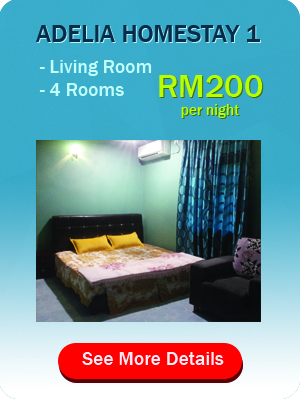 Adelia Homestay offers affordable price package, starting from RM200 for 1 night (4 Rooms). Spacious parking space; up to 10 cars. The district of Pasir Mas covers an area of 577 square kilometers and is bordered by the districts of Tumpat to the north, Tanah Merah to the south, Kota Bharu to the east, and the Thai district of Su-ngai Kolok (Malay: Sungai Golok) to the west. Due to its geographical location, it acts as the main gateway of the East Coast of Malaysia to Thailand and is also traversed by major road transport routes from the West Coast to the state capital of Kota Bharu. The main town of the same name was once the second biggest in the state until the early 1990s when it was overtaken by Tanah Merah. The town is blocked from expanding to the south by the Kelantan River. To the north, the railway line splits the town – further limiting land suitable and desirable for commercial real estate development. Welcome to Adelia Homestay, Pasir Mas Kelantan. Adelia Homestay offers affordable price package, RM200 per night (4 rooms). Why you should stay here?